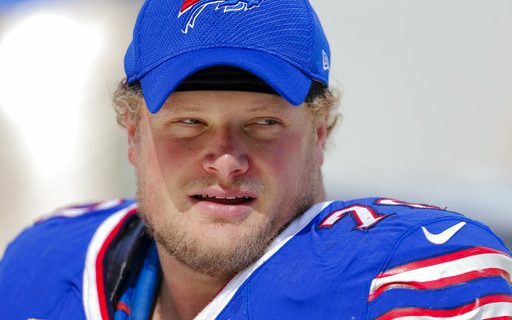 The news Friday morning of Eric Wood’s retirement came as a surprise. It also hit hard for Buffalo sports fans who had grown to see Wood as a true warrior, beloved community member, charity leader and team spokesman. The news was first reported by Scout Fantasy Sports. Since then, ESPN’s Adam Schefter has reported that a “complicated medical situation” regarding a neck injury is what forced Wood to leave the game after nine seasons. Wood took every snap in 2017, which added to the surprise. A former first round draft pick, Wood played 120 games for the Bills and battled through two broken legs and a knee injury during his career. This past summer, Wood was given a contract extension. That will have an effect on what Wood’s retirement will do to the Bills salary cap. Mike Ginnetti of Spotrac.com tells Buffalo Sports Page that the Bills will deal with $10.3 milion dollars in dead cap space in 2018. That’s due to the fact that the retirement is injury-related, and all of the guaranteed money accelerates right onto the cap. This unexpected news now leaves the Bills searching for a starting center. Ryan Groy would appear to be the early favorite. The team matched an offer sheet by the Rams, and have Groy under contract for 2018 at a manageable salary of $2.5 million dollars. The matching of the offer always seemed to be some kind of insurance at the center position, because Groy never saw any significant snaps at guard in 2017. The Bills return nearly their entire offensive line in 2018. Cordy Glenn’s injury and salary status may determine his 2018 status, but every other important player is back. The most lasting effect of Wood’s retirement will be in the locker room. He has been a leader and a team spokesman for his entire career. If the team does not re-sign Kyle Williams (and if Tyrod Taylor does not return), there will be a leadership void that will have to be filled by the next generation of young players. The team is expected to formally announce Wood’s retirement on Monday.